As is common throughout the automotive industry, badges are often added to donate the differing levels of standard equipment between two or more versions of the same model. In the case of the Peugeot 406 Coupe the base level specification is the "S" version and the top of the range is the "SE." 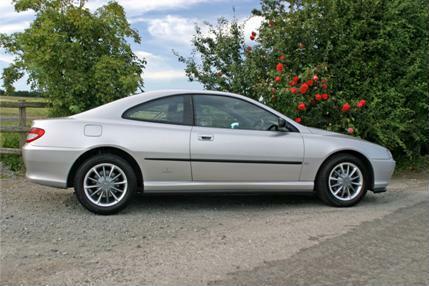 However you won't find an "S" badge on the rear of any 406 Coupe, in fact when it was introduced there was no mention of an "S" version at all in the Peugeot brochures, and there wasn't a 2.0 litre SE version available at all to begin with. A basic specification 2.0 litre model or a 3.0 litre V6 was referred to simply as the 2.0 or the 3.0 V6 and it was not until around 2002 that the Peugeot brochures began to refer specifically to an "S" and "SE" specification. Having said there won't be an "S" badge on view, the "SE" top of the range models had no such reservations and the "SE" badge will be proudly displayed on the boot when applicable throughout the range. Some owners prefer a completely debadged rear end, but there are many quick and easy ways to tell an "S" from an "SE." As a "rule of thumb" the quickest and easiest way to tell the difference is to look at the interior seats. All "SE" models had leather seats, base level models had cloth seats. In the relatively unlikely event that a base model owner has fitted the interior of an "SE" model into his/her car, the next step would be to look at the headlights. 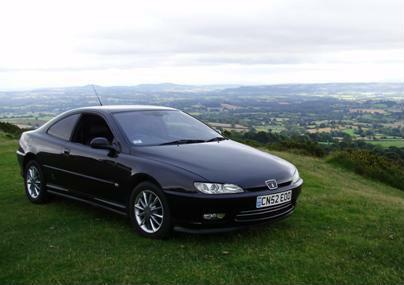 The presence of headlight washers indicate an "SE", those without will be the "S."
The good news for all 406 Coupe owners is that the Coupe was at the time marketed as a luxury car and commanded "on the road" prices ranging from £20,000 for a base level 2.0 litre, to £28,000 for the flagship 3.0 V6 SE. 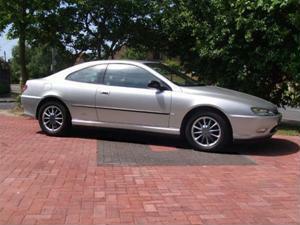 Consequently even the base level "S" versions were cars which for their time had a very high level of specification. Of course over the lifetime of the 406 Coupe, specifications changed, and some pieces of equipment that were originally "optional extras" became standard, a good example being the built in Satellite navigation, initially this was an option on all models, but later in life it became a standard fitment to "SE" models, but remained an option on all other models. It is therefore not possible to provide a single list of what equipment will be found on a "S" / base version and what will be found on an "SE" version because it depends on the year of the car in question. In 1997 the Specification and differences between the models are as shown in this document. In 2000 the Specification and differences were as shown in this document. In 2002 the Specification and differences were as shown in this document. There is a certain advertisement being shown on British TV at the moment which promotes the attributes of the product by saying, "it does exactly what it says on the tin." The same tag line could easily be associated to the Peugeot Silver & Black Special Edition 406 Coupe. 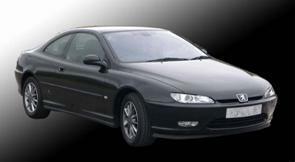 The car, as its name suggests is quite simply a Special Edition of the Peugeot 406 Coupe. This particular model can be had in a choice of colours, providing of course that you limit your choice to either... Silver or Black. My aim here has purely been to provide some basic information about this limited edition, and to highlight the differences between the standard trim options found in the regular 406 Coupes and those found in the Silver & Black. I must begin by saying, that I am grateful to Mr. Andy Swietochowski and his staff at the Peugeot customer care centre, not only for their assistance in providing me with the all the information relating to the production run of the Silver & Black Editions, but also for obtaining permission to release to me a precis of the marketing strategy for this model. It was refreshing to find that a large corporation such as Peugeot was still willing to assist a small but enthusiastic group such as ours, with research in order to answer some specific questions... Thanks again. The Silver & Black Special Editions were manufactured for the UK market between the months of June and October in 2002. Being a limited edition Peugeot had to consider exactly how many vehicles of this type they were going to make. They eventually decided that they would limit the entire production run of Silver & Black editions, to a mere 400 examples in total. At the time of their production, the 2.0 litre petrol engine from the Coupe range had recently been replaced by the 2.2 litre engine from the 607. 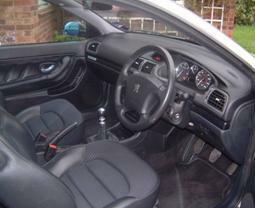 In addition the 2.2 HDi engine had recently been introduced into the Coupe range and Peugeot wanted the Special Edition to have the choice of both these powerplants. The Peugeot marketing department felt the introduction of the special edition (which was being referred to at the time as "the summer special"), was an ideal way to focus on the new engine option and to highlight the fact that it now came with an additional 22 bhp, and cruise control and ESP (Electronic Stability Programme) as standard. They also felt that by combining the new engine option with an attractive new interior treatment, "the summer special" could be used as the focal point of the year's marketing and sales initiative for the entire Coupe range. Following further discussions at Peugeot UK with regard to the production volumes and the number of derivatives which were to be made, it was decided that the 400 vehicles which made up the entire production run would have a 50/50 colour split. Furthermore it was decided that specific numbers of each engine option would be produced. They eventually decided that 250 vehicles would be powered by the 2.2 HDi engine and that the remaining 150 vehicles would be fitted with the 2.2 petrol option. It was initially anticipated that all these vehicles would have been produced during the months of June and July 2002, with a production schedule of 200 examples per month, at a ratio of 125 diesels and 75 petrol versions in each month. That was the plan, but by the time that the production of the Silver & Black editions ended, the production period had stretched until October, and for an as yet unexplained reason, an extra 7 HDi's had been made. When they hit the road in the UK, you paid: £21,145 for the 2.2 petrol version, and £22,645 for the diesel. It may be appropriate at this point to mention that in April 2002, the French also had a limited edition produced. It came with exactly the same specification as the Silver & Black edition in the UK. Again they also kept the colour options to just Silver & Black, which in French "Peugeot parlance" translates to "gris thallium" and "noir granit". The French equivalent of our Silver & Black edition is referred to on the continent as the Coupe Sport. So what is different about these Special Editions? If you were thinking that they would be, top of the range, high spec, with all available extras and more, you would be sadly mistaken. The Silver and Black is based on the S version and so has a level of trim that is of a lower specification than that found in the later SE models. It does however have a higher level of trim than the basic "S" models, so as a "rule of thumb" you wouldn't go far wrong by simply saying that the equipment level of a Silver & Black edition is somewhere between that of the "S" & "SE" versions. What this overview doesn't take into account however, are some unique items of trim made specifically for the limited edition. There aren't that many and some are glaringly obvious and easy to spot, whilst others are far more subtle and much harder to see. Looking at the car from the outside, it does of course have the same stunning shape and outline of all other Coupes in the range. The colour as already mentioned will be either Silver or Black with no exceptions. When I say Silver or Black, this obviously equates to "Satellite grey" or "Granite" in the Peugeot colour options list, but Silver or Black would be the colours that everyone other than a Peugeot buff would recognize them as. Both these colours are available throughout the Coupe range, so there's nothing particularly unique about the colour. What is unique however, and is the first and most obvious difference between the Silver & Black and the regular Coupes produced for the UK market, are the eye catching, 12 spoke, 16" Nautilus alloy wheels. 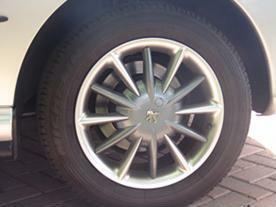 These wheels are more common on the continent, but other than a handful of cars produced by Peugeot to commemorate the 70th anniversary of Pininfarina (the Settant'anni edition) the Nautilus wheels are unique to Silver and Black Coupes sold on the UK market. Remaining with the immediately obvious, unique features, the second difference stares at you the moment the doors are opened. 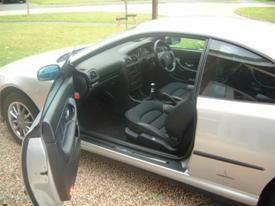 This is of course the half leather seat trim. All other Coupes produced for the UK market have either a cloth or full leather trim in various colour options. The Silver & Black Edition is the only Coupe model to feature the half leather seat trim. In keeping with its silver and black colour scheme, the seats have a black leather surround, with a 2 tone black cloth insert for the seat and back position. The pattern on the seat and back inserts form a crisscross black check, and as such, it has not surprisingly been named the "Chess pattern" by Peugeot. This seating has clearly been chosen to blend in with the silver and black ethos and as such it makes a most comfortable and aesthetically pleasing addition to the overall package. 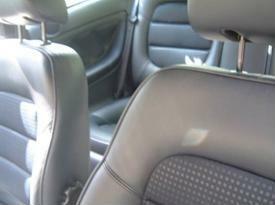 What the seats do not have however is the heated, electronic memory and movement capability as found in the SE models. The other differences are far more subtle, so subtle in fact that it is only when other Coupe owners look inside that they get noticed. I am proud to be the owner of a 2.2HDi, Silver & Black Edition, but as this was my first Coupe I discovered that what I had taken for granted as being the norm in a Coupe cockpit was only highlighted to me as unique during recent meetings of the 406 Coupe Club, at The French Car Show at Bruntingthorpe and later at The Santa Pod Raceway. Obviously, due to the fact that this model was manufactured in 2002 the cockpit configuration is that of a D9 model, but with a few added, subtle differences. 1. 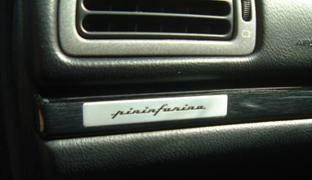 A different style of Pininfarina badge on the dashboard. 2. The dashboard trim itself is finished in a shiny black, wood effect. 3. The wing mirrors have a black outer casing rather than the standard dark grey of other models. 4. 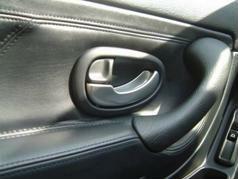 The interior door handles are metallic and aluminium in colour. Being based on the "S" version, the Silver and Black does not have the electronic folding option on its wing mirrors and neither does it have the day & night sensitive electrochrome rear view mirror found on the SE models. Satellite navigation was an option not a standard fitment, but as mentioned earlier, cruise control and ESP are fitted as standard on all 2.2 engines. The JBL amplifier and 8 speaker system however was a specific upgrade in the Silver & Black, because although standard on SE models, it was only available as a cost option on normal S versions. The Silver & Black Special Edition was never made with the intention of being "the best of the best", had this been the case, the specification would have needed to exceed that of the latter SE models and the power of the mighty V6 3.0L engine. In fact it does neither. What you do get however is a 406 Coupe with the same stunning looks and appeal of all other 406 Coupe variants but with a few subtle differences to enhance the aesthetics of the car. You also get a car produced in such limited numbers that for rarity value alone there can be little doubt that the Silver & Black is a very special edition of what is already a very special car. Although technically the Silver and Black Edition was only available in the UK, similar variants were also released elsewhere in Europe under various guises such as, the "Black and Silver" in Switzerland and the "Coupe Sport" in France. These European equivalent versions, while essentially the same as the UK special edition, did also have some additional options available to their owners. These options included having the V6 engine in both manual and automatic forms, and also being able to choose alternative body colours such as Hades Grey and Aegean Blue. A full article on the Limited Edition Settant anni model, will be available very soon. This facelift model was not available in the UK and was introduced on the continent towards the end of the 406 Coupe production era. We are aware that one was imported into the UK in 2011 by a Coupe club member and we hope to have a fuller article available very soon.